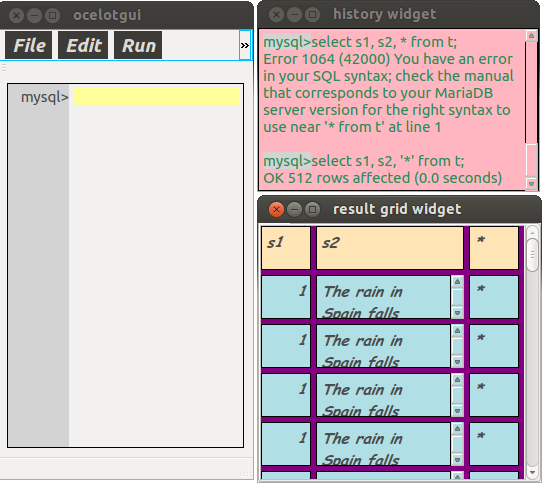 The Ocelot GUI (ocelotgui), a database client, allows users to connect to a MySQL or MariaDB DBMS server, enter SQL statements, and receive results. Some of its features are: syntax highlighting, user-settable colors and fonts for each part of the screen, result-set displays with multi-line rows and resizable columns, and a debugger. Copyright (c) 2014-2017, Ocelot Computer Services Inc. All rights reserved. For the GPL license terms see https://github.com/ocelot-inc/ocelotgui/blob/master/LICENSE.GPL. For instructions for end users see the User Manual. 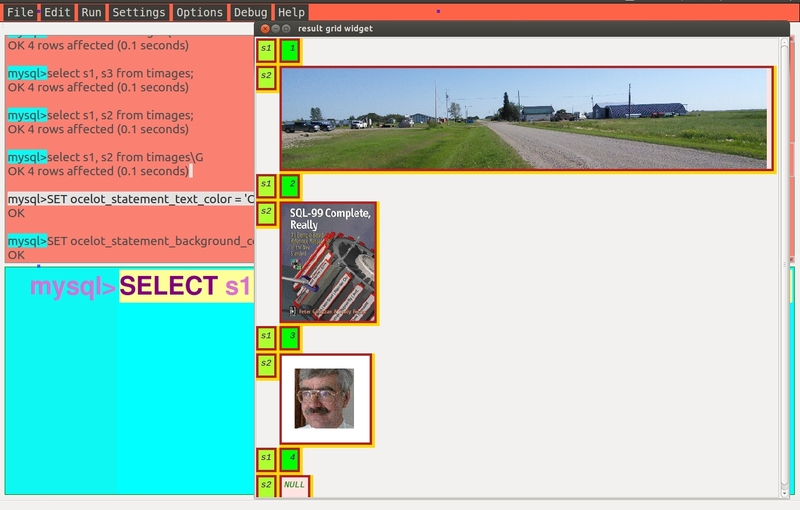 For ocelotgui screenshots see http://ocelot.ca/screenshots.htm. For ocelotgui/debugger screenshots see http://ocelot.ca/blog/the-ocelotgui-debugger. This README file has installation instructions, screenshots, and the user manual. The installation instructions in this file are for Linux. If you prefer to run on Windows, read the installation instructions in the file windows.txt and come back to this file to read the User Manual section. The basic prerequisites for installation are Linux, and the Qt library. The libmysqlclient library will also be necessary, at runtime. You probably will find that the Qt package is already installed, since other common packages depend on it. If not, your Linux distro's repositories will provide a Qt package. For example, on some platforms you can say "sudo apt-get install libqt5core5a" to install Qt5. You will need to know the version of the Qt library. It can be found with find /usr/lib -name "libQt*Gui.so*", or find /usr/lib64 -name "libQt*Gui.so*". If the response starts with libQtGui.so.4 then you have Qt4, if the response starts with libQt5Gui.so.5 then you have Qt5. Alternatively it sometimes can be found with qmake -v.
The Qt library is necessary for ocelotgui installation. You may find that the libmysqlclient.so library is already installed, if you have used a MySQL or MariaDB client program before. If not, your Linux distro's repositories will contain it, usually with a name like "libmysqlclient-dev" or "libmysqlclient-devel". A tip for Mageia 5: You can use "urpmf " to find what packages contain libmysqlclient.so. If the answer is lib64mariadb18, you can install it with: sudo urpmi lib64mariadb18. 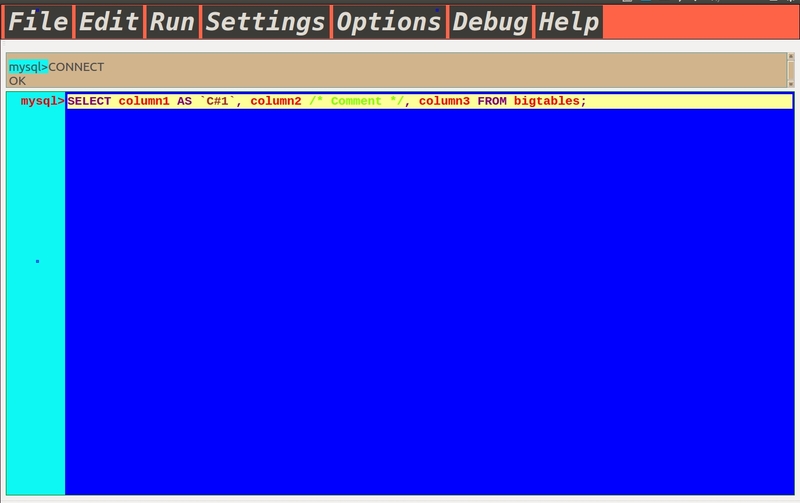 Several other directories are searched; for details start ocelotgui after installation and choose Help | libmysqlclient. The libmysqlclient library is not necessary for ocelotgui installation; however, it is necessary at runtime in order to connect to a database server. There are ocelotgui binary packages for platforms such as Ubuntu where "Debian-like" packages are preferred, or platforms such as Mageia/SUSE/Fedora where "RPM-like" packages are preferred. If one of the following ocelotgui binary packages is compatible with your platform, cut and paste the corresponding pair of instructions onto your computer and you can be up and running in about 15 seconds. 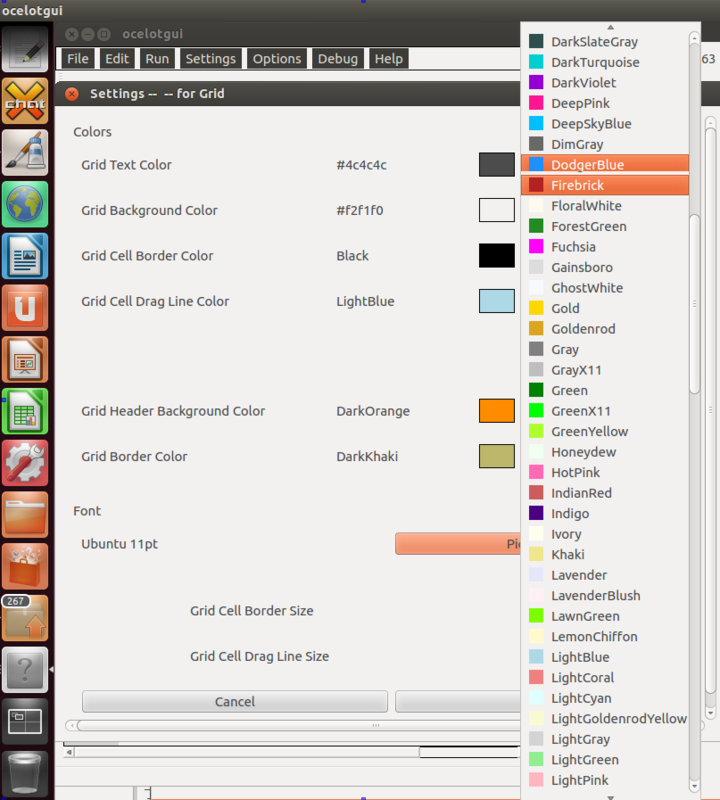 The ocelotgui source package has everything necessary to compile and link and install for any Linux distribution. If the typical developer packages such as cmake and the gcc c/c++ compiler has been installed already, building an executable usually takes less than fifteen minutes. A clone has the latest source, but not executables. A clone may contain patches which are not yet part of a release. Ordinarily users are advised to use a release rather than a clone, until they have used ocelotgui for a while. or use a browser to go to https://github.com/ocelot-inc/ocelotgui/releases and click ocelotgui-1.0.6.tar.gz. Usually the result will go to subdirectories of /usr, in which case, if /usr/bin is on your PATH, then saying ocelotgui will start the program. For additional cmake options see the comments in CMakeLists.txt. For more commentary about compiling and building, read an ocelotgui.cpp comment that begins with the words "General comments". For instructions to build from source on Microsoft Windows, see the file windows.txt. -- if the program starts, and menu items such as Help|Manual work, then installation is successful. Stop again with File|Exit or control-Q. Warning: Some menu shortcut keys may not work properly with Ubuntu 14.04. Copyright (c) 2014-2017 by Ocelot Computer Services Inc. All rights reserved. The ocelotgui application, more fully 'The Ocelot Graphical User Interface', allows users to connect to a MySQL or MariaDB DBMS server, enter SQL statements, and receive results. Some of its features are: syntax highlighting, user-settable colors and fonts for each part of the screen, and result-set displays with multi-line rows and resizable columns, and a debugger. Ocelot Computer Services is a Canadian company which has specialized in database products for thirty years. Its main employees worked for MySQL AB and Sun Microsystems and Oracle between 2003 and 2011. 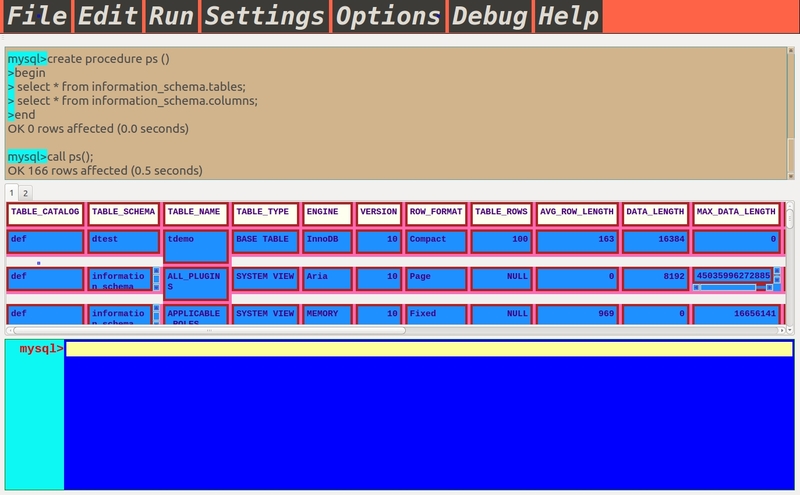 The ocelotgui program is a front end which connects to MySQL (tm) or MariaDB (tm). In some ways it is like the basic mysql client program, with added GUI features: full-screen editing, syntax highlighting, tabular display, customized fonts and colors. It differs from some other front-end GUI products because it is open source (GPL), it is written in C++, and it makes use of the Qt multi-platform widget library. The product status is: stable. It has been known to work as described in this manual on several Linux distros. It is stable, in the sense that there are no known severe errors and the features are frozen until the next version. Ocelot will address any bug reports and will answer any questions. To download the product go to https://github.com/ocelot-inc/ocelotgui. Instructions for installation will be in the README.md file. This location may change, or alternate locations may appear. If so there will either be an announcement on github or on ocelot.ca. The package contains source code and an executable file named ocelotgui. There must be an instance of MySQL or MariaDB running somewhere. 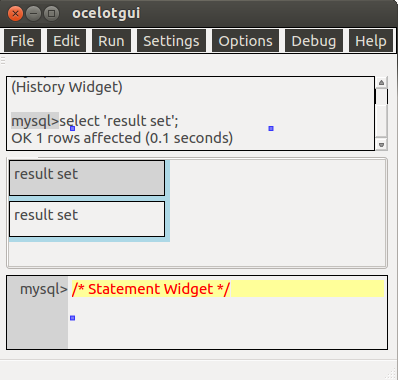 If connection is possible with the mysql client and does not require unusual options, then connection is possible with ocelotgui. 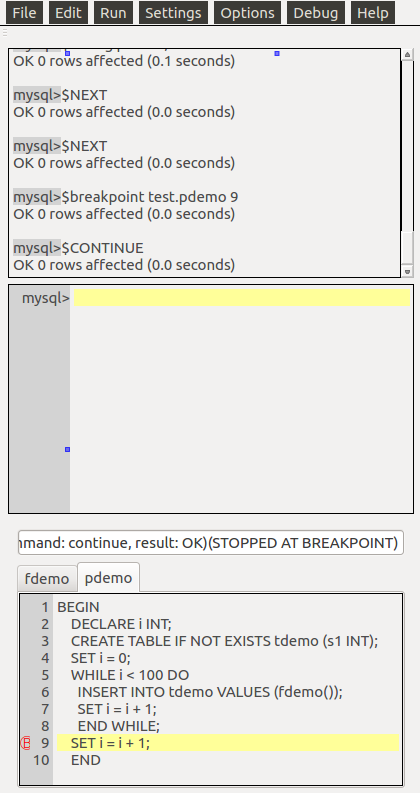 If there is a my.cnf file, ocelotgui will read it, just as the mysql client would. If there are connection-related options on the command line, ocelotgui will accept them just as the mysql client would. Therefore the typical way to start the program is to say ocelotgui [--option [--option...]] For a description of options see https://github.com/ocelot-inc/ocelotgui/blob/master/options.txt. If a password is required but not supplied, a dialog box will appear. Or, if the initial attempt to connect fails, an error message will appear saying it is necessary to choose File|Connect, which will cause the dialog box to appear. 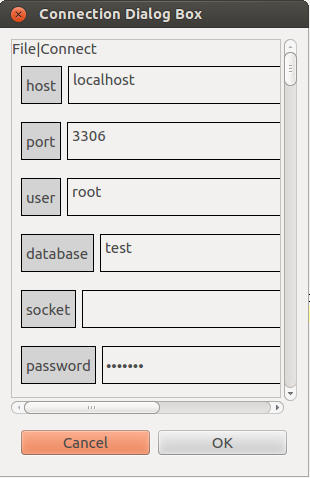 The dialog box has many possible settings (see the list in https://github.com/ocelot-inc/ocelotgui/blob/master/options.txt); however, for getting started, the ones that matter most are the ones at the top: host, port, user, socket, password, protocol. If the connection still fails, then ocelotgui will still come up, but only non-DBMS tasks such as screen customizing will be possible. statement widget, where users can type in instructions. Initially, though, only the menu and statement widget will appear. Again, this should be reminiscent of the way the mysql client works: statements are typed at the bottom of the screen, and appear to scroll off the top after they are executed, with results in the middle. The statement widget is an editable multi-line text box. The usual control keys that work on other text editors will work here too; see the later description of Menu Item: Edit. The program includes a syntax checker and can recognize the parts of speech in MySQL grammar. It will do syntax highlighting by changing the color, for example comments will appear in light green, identifiers in green, operators in dark gray, and so on. The colors can be customized, see the later description of Menu Item: Settings. The left side of the statement widget is reserved for the prompt, and cannot be typed over. Initially the prompt will be 'mysql>' but this can be changed, see the later description of Client Statements: Prompt. For example, this screenshot shows the statement widget after the user has changed the default prompt and entered an SQL statement. The statement has keywords in magenta, literals in dark green, operators in light green, and comments in red. The prompt on the left has a gray background. Major Feature Alert: this is not merely a GUI that only will highlight words that are in a list of keywords. This GUI will parse the complete MySQL or MariaDB grammar, without needing to ask the server. So the highlighting will be correct, syntax errors will be underlined in red, and -- since the parsing method is predictive -- there will be continuous hints about what word is expected next, and optionally an error message explaining suspected syntax problems before they go to the server. Once a statement has been entered and is ready to be executed, the user can hit control-E, choose menu item Run|Execute, or place the cursor at the end of the text (after the ';' or other delimiter) and type Enter. It is legal to enter multiple statements, separated by semicolons, and then execute them in a single sequence. A client statement is a statement which changes some behavior of the client (that is, of the ocelotgui front end) but does not necessarily go to the MySQL/MariaDB server. Of the statements that the MySQL Reference manual describes in section 'mysql commands' http://dev.mysql.com/doc/refman/5.6/en/mysql-commands.html the ocelotgui program has working equivalents for: clear, delimiter, exit, prompt, source, tee, and warnings. 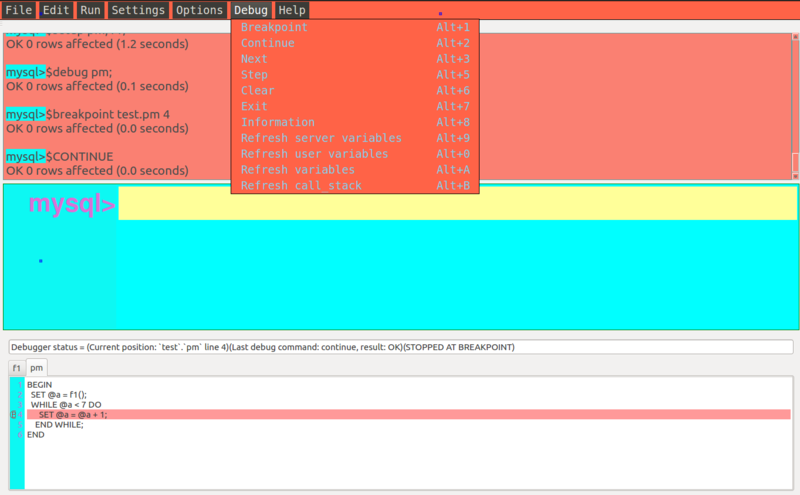 For example, entering 'quit;' followed by Enter will cause the program to stop. It is sometimes not mandatory to end a client statement with ';', but is strongly recommended. There are some enhancements affecting the PROMPT statement. The special sequence '\2' means 'repeat the prompt on all lines', and the special sequence '\L' means 'show line numbers'. For example, 'PROMPT \2\Lmariadb;' will change the prompt so that each line begins with '[line number] mariadb>'. Once a statement has been executed, a copy of the statement text and the diagnostic result (for example: 0.04 seconds, OK) will be placed in the history widget. Everything in the history widget is editable including the prompt, and it simply fills up so that after a while the older statements are scrolled off the screen. Thus its main function is to show what recent statements and results were. Statements in the history can be retrieved while the focus is on the statement widget, by selecting 'Previous statement' or 'Next statement' menu items. Initially the history widget will show some statements from past sessions which are stored in a history file. If a statement is SELECT or SHOW or some other statement that returns a result set, it will appear in the result widget in the middle area of the screen. The result widget is split up into columns. Each column has a header and details taken from what the DBMS returns. The width of the column depends on the result set's definition, but extremely wide columns will be split onto multiple lines. That is, one result-set row may take up to five lines. If the data still is too wide or too tall to fit in the cell, then the cell will get a vertical scroll bar. The user can change the width of a column by dragging the column's right border to the right to make the column wider, or to the left to make it narrower. The result widget as a whole may have a horizontal and a vertical scroll bar. The vertical scroll bar moves a row at a time rather than a pixel at a time -- this makes large result sets more manageable, but makes the vertical scroll bar unresponsive if each row has multiple lines and the number of rows is small. For example, this screenshot shows the whole screen after the user has typed the statement "select * from information_schema.tables;" on the statement widget and then executed it. The statement text has been copied to the history widget, the statement widget has been cleared, the result widget has the rows. 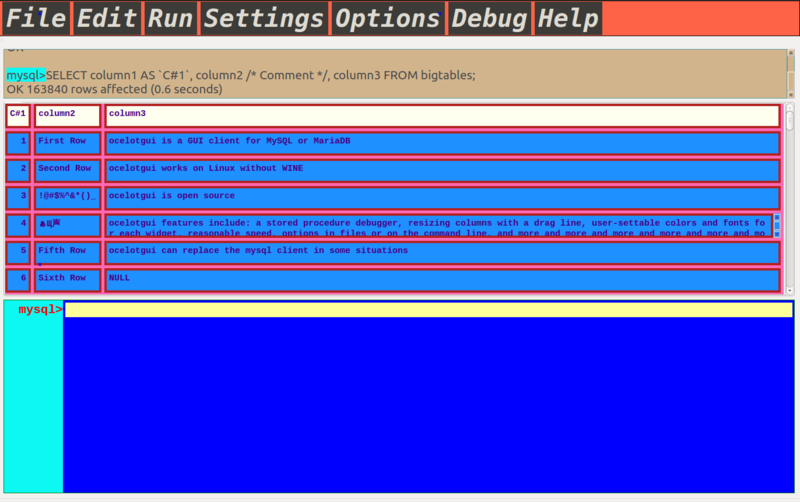 The user has dragged the border of the fourth column to the left, causing a scroll bar to appear. The menu at the top of the screen has File, Edit, Run, Settings, Options, Debug and Help. File|Connect, or Ctrl+O, starts the Connect dialog box. File|Exit, or Ctrl+Q, stops the program. Edit|Undo or Ctrl+Z, Edit|Redo or Ctrl+Shift+Z, Edit|Cut or Ctrl+X, Edit|Cut or Ctrl+X, Edit|Copy or Ctrl+C, Edit|Paste or Ctrl+V, and Edit|Select or Ctrl+A, all work in the conventional manner. Edit|Redo can only redo the last change. Previous Statement or Ctrl+P and Next Statement or Ctrl+N will copy earlier statements from the history widget into the statement widget, so that they can be edited or re-executed with Run|Execute or Ctrl+E. Run|Execute or Ctrl+E or Ctrl+Enter causes execution of whatever is in the statement widget. 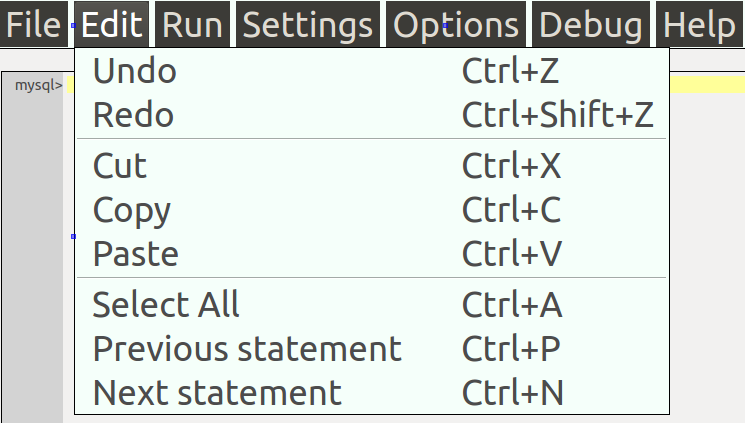 Run|Kill or Ctrl+C tries to stop execution -- this menu item is enabled only when a long-running statement needs to be aborted by user intervention. Settings|Menu, Settings|History Widget, Settings|Grid Widget, Settings|Statement, and Settings|Extra Rule 1 are items which affect the behavior of each individual widget. The color settings affect foregrounds, backgrounds, borders, and (for the statement widget only) the syntax highlights. The font settings affect font family, boldness, italics, and size. Font settings involve further dialog boxes which are standard with Qt. There may be additional choices affecting appearance, for example the width of the border used to drag columns in the result widget. 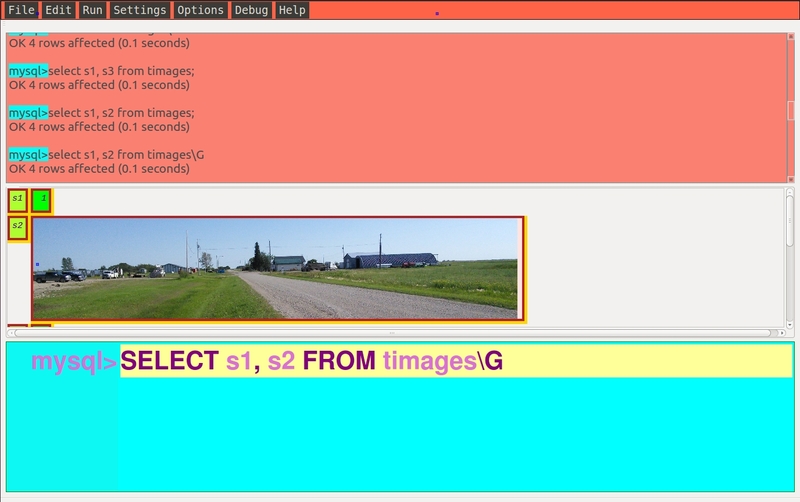 Settings|Extra Rule 1 is conditional -- for example, to specify that BLOBs should be displayed as images on a pink background, set Grid Background Color Pink, set Condition = data_type LIKE '%BLOB', set Display As = image, then click OK.
Options|detach history widget, Options|detach result grid widget, Options|detach debug widget are for turning the respective widgets into independent windows, so that they can be moved away from the statement widget, or resized. A detached widget is always kept on top of the other widgets in the application screen. When a widget is already detached, the menu item text will change to "attached" and clicking it will put the widget back in its original position. The items on the Debug menu are enabled only when a debug session is in progress. The way to debug SQL stored procedures or functions will be explained in a later section. Help|About will show the license and copyright and version. Help|The Manual will show the contents of README.md (the manual that you are reading) if README.md is on the same path as the ocelotgui program; otherwise it will show a copyright, a GPL license, and a pointer to README.md. Help|libmysqlclient will advise about finding and loading the libmysqlclient.so library. Help|settings will advise about how to use the Settings menu items. $install -- this is always the first thing to do. $setup routine_name [, routine_name ...] -- prepares so '$debug routine_name' is possible. 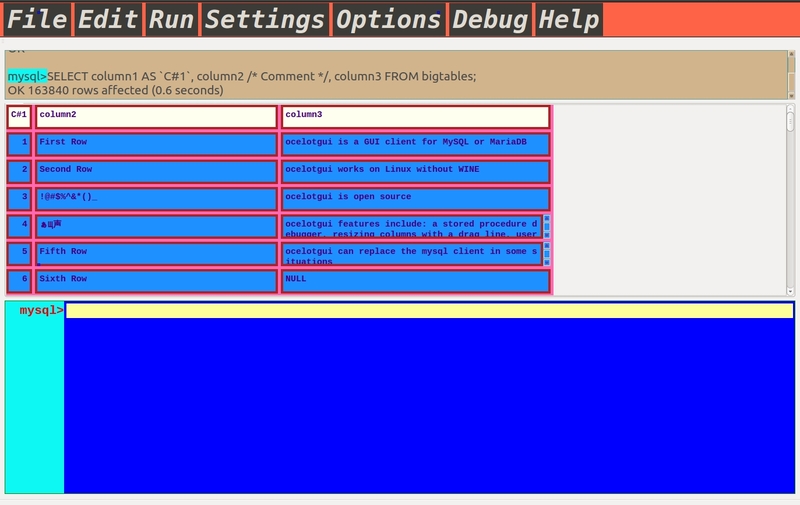 $debug routine_name -- starts a debug session, shows routines in a tabbed widget. $breakpoint routine_name line_number or Debug|breakpoint -- sets a breakpoint. $clear routine_name line_number -- clears a breakpoint. $next or Debug|Next -- goes to next executable line, without dropping into subroutines. $step or Debug|Step -- goes to next executable line, will drop into subroutines. $continue or Debug|Continue -- executes until breakpoint or until end of procedure. $refresh breakpoints -- refreshes xxxmdbug.breakpoints table. $refresh server_variables -- refreshes xxxmdbug.server_variables table. $refresh variables -- refreshes xxxmdbug.variables table. $refresh user_variables -- refreshes xxxmdbug.user_variables table. $exit or Debug|Exit -- stops a debug session. 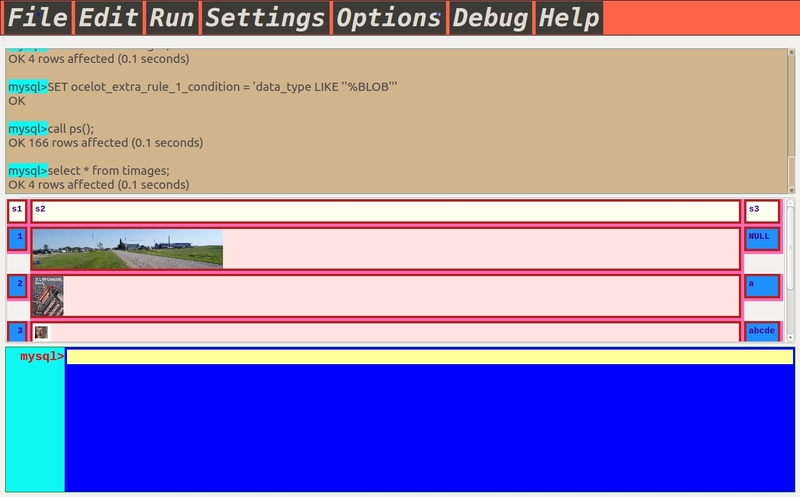 For a walk through a debugger example, with screenshots, see this blog post: http://ocelot.ca/blog/the-ocelotgui-debugger. For reference, read: https://github.com/ocelot-inc/ocelotgui/blob/master/debugger_reference.txt. Vertical: If a user starts the program with ocelotgui --vertical=1 or ends a statement with backslash G, results come up with one column per row. 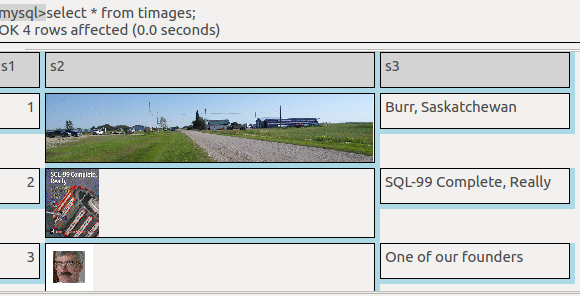 Images: If a user chooses Settings | Extra Rule 1 from the menu, and sets the Condition and Display As boxes as described earlier, and selects rows which contain LONGBLOB columns, and the column values are images (such as PNG or JPEG or BMP or GIF format data), ocelotgui will display the result as images. Result-set editing: If a user clicks on a column in the result set and makes a change, an update statement will appear in the statement widget. For example, if a result set is the result from SELECT column1, column2 FROM t;, and the column1 value is 5, and the column2 value is 'ABC', and the user changes the column2 value to 'AB', then the statement widget will show UPDATE t SET column2 = 'AB' WHERE column1 = 5 AND column2 = 'AB';. The user then has the choice of ignoring the update statement or executing it. Detaching: If a user chooses Options | detach history widget or Options | detach result grid widget, then the widget will become a separate window which can be moved or resized. 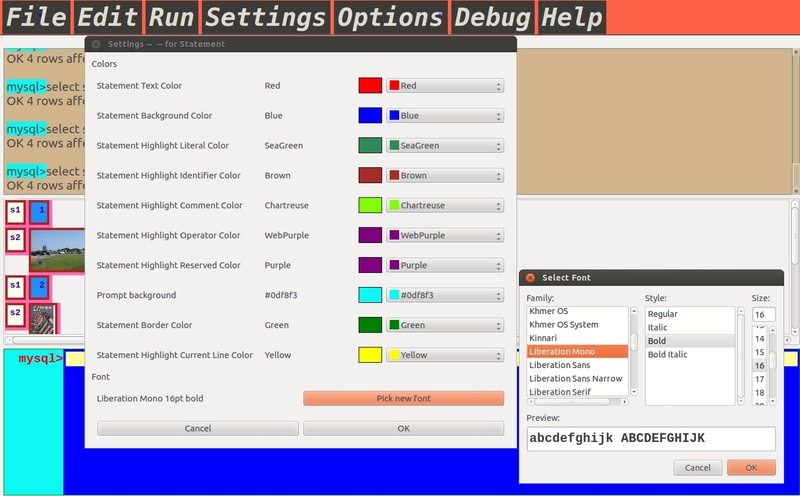 Colors: The Colors and fonts dialog boxes have a simple way to choose colors, by selecting from a choice of 148 color names / color icons. Users can also change colors by saying SET object_name_color = color-name | hex-rgb-value. In fact ocelotgui mixes the modes: for example if a user chooses Settings | Grid Text Color, then clicks on the 'Red' icon, then clicks OK, ocelotgui generates a statement "SET ocelot_grid_text_color = 'Red'". This makes the instruction easy to repeat or put in a script. RE: SQL_MODE. To distinguish between literals and identifiers enclosed in double quotes, ocelotgui needs to know the value of sql_mode (ansi_quotes). It calculates this automatically; however, in rare circumstances it can fail to detect changes on the server. 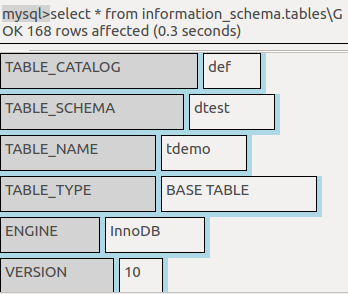 If that appears to be the case, say SET SESSION SQL_MODE = @@SESSION.SQL_MODE; to update it. RE: TAB COMPLETION. While a user is entering an SQL statement, ocelotgui will display a list of possible words that may follow. Hitting the Tab key will cause the first word in the list to be displayed and accepted. RE: HINTING FOR COLUMN NAMES. Although hints for syntax appear by default, hints for table / column identifiers do not. In order to make identifiers appear on the hint list: (1) ensure the setting for auto_rehash has not been turned off; (2) enter the statement "REHASH;" to make the client ask the server for a list of identifiers in the current database; (3) when entering an SQL statement, type ` (backtick) at the point where an identifier is expected. RE: FONT. By default, ocelotgui uses a fixed-pitch (mono) font that has similar attributes to whatever font was in use at the time it started. This may be a bad choice. We recommend trying out other fonts with the Settings menu for each widget. RE: PERMANENT CUSTOMIZING. Changes to settings can be done with the Settings menu items, but such changes are not permanent. So note the commands that ocelotgui performs when settings are changed, and paste them into a file. Later this file can be executed (for example with SOURCE file-name), whenever ocelotgui is started again. Alternatively, settings can be placed in an options file such as my.cnf. RE: DEBUGGING WITH MYSQL 5.7. Oracle has made a significant incompatible behavior change in version 5.7, which affects the debugger. The originally recommended workaround was to say "set global show_compatibility_56=on;". We believe we have made a more permanent fix for this problem in ocelotgui version 1.0.6. RE: CONNECTION DIALOG. As stated earlier, if a password is necessary to connect, it is sufficient to start ocelotgui with "--password=password" or by choosing File|Connect and typing a password in the Password field (the sixth field in the Connection Dialog Box). Also on the Connection Dialog Box, if the server is running on the same computer as the ocelotgui client, it is sometimes a good idea to enter '127.0.0.1' in the host field, instead of 'localhost'. 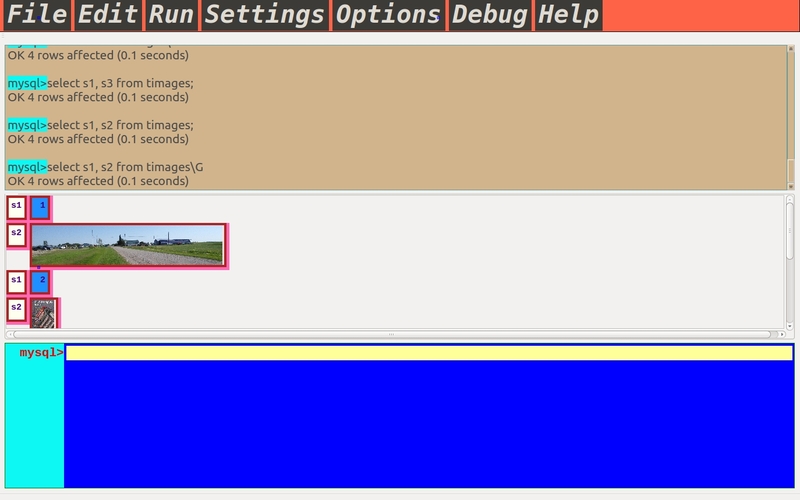 To disable this feature, start ocelotgui with --ocelot_client_side_functions=0. RE: HOVERING. Use the mouse to hover over a word in the statement widget, and Ocelot will display what kind of word it is, for example "table identifier". RE: FORMAT. Click Edit|Format, and Ocelot will change the contents of the statement widget so that keywords are upper case and sub-clauses or sub-statements are indented. RE: HISTORY. By default the history does not contain any rows from result sets of previous statements. To change this, click Settings|History and enter a number for Max Row Count. Registered github users can simply go to https://github.com/ocelot-inc/ocelotgui and click the "Star" button. Send bug reports and feature requests to https://github.com/ocelot-inc/ocelotgui/issues. Or send a private note to pgulutzan at ocelot.ca. There may be announcements from time to time on Ocelot's web page (ocelot.ca) or on the employee blog (http://ocelot.ca/blog). Copyright (c) 2002-2017 by Ocelot Computer Services Inc. All rights reserved.